Buttons turned out to be a harder part of the project that I had anticipated. I researched glass buttons, ceramic buttons, commercially made wooden buttons, pearl buttons, horn buttons, pewter buttons and shell buttons. The only truly British buttons that I found were pewter buttons, which are too heavy for a silk shirt. This meant that I had to go DIY, and I had a go at creating my own wooden buttons, with my wonderful friend Zoe by my side. The first step was to go to the Scenic Arts department with my twig of choice. We cut it into tiny discs with a band saw and then drilled two little holes into each disc. Next was to sand down all of the rough edges and to remove the bark on the edges. I quite liked how it looked, but I didn't want it to snag on the delicate silk fabric. The buttons on the bottom are before sanding and the buttons on the top are after sanding, and you can see how much difference it makes. 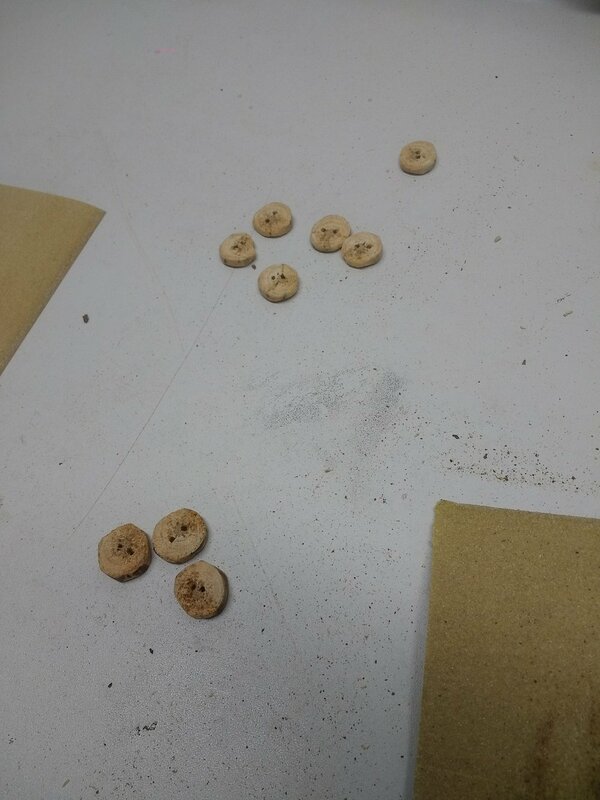 The last step in the button making process was to waterproof them. I soaked the buttons in Thompson's Water Seal (made in Sheffield) for a few hours and that should be enough for them to survive the washing machine. I'm really proud of my little buttons and think they look so good! Here's a sneak peak of how they look on the shirt. Thanks for reading and to Zoe for helping me out with these!